These online resources give users access to the greatest works of art in history. They can provide a comprehensive art history education for free! One of the primary benefits of living in this digital age is the access we have to unlimited educational resources. It doesn’t matter what your interests are, the Internet has you covered. You’ve heard the saying, and it’s usually true: there’s probably an app for that! The immediacy of availability of those online resources is part of the magic of modern connectivity. People may be unable to view the greatest works of art in person, but they can certainly look up those works online. In most cases, high-definition photos are available, so you can actually see the brush strokes of a painting or the cracks in centuries-old marble statues. Sort of brings out your inner art history geek, no? The following apps, websites, and online resources give users access to the greatest works of art in history. If utilized properly, they can provide a comprehensive art appreciation education for free! Let’s look at how each resource works in relation to a few seminal paintings in history and what we can learn about them. [caption id="attachment_88653" align="aligncenter" width="3508"] Wheatfield with Crows, 1890. 50.2 cm × 103 cm (19.9 in × 40.6 in). Van Gogh Museum, Amsterdam[/caption] Vincent Van Gogh’s apocalyptic “Wheatfield with Crows” (1890) shows a sprawling golden field bisected by a crossroads. A dark murder of crows takes flight against a deep, unpredictable sky. The colors are bold and expansive. They take root in your imagination. Use your fingers to zoom in on the horizon. Through the app, you can get closer to the painting than you ever could in real life. Look at how the quick, impulsive brushstrokes create a tone of almost frenzied terror and wonder. Frenzied, but coherent. There’s a logical order to this scene that’s difficult to pinpoint. The scene is invigorating, like we’re at the edge of the world looking down into the gulf. It’s as if we are called to contemplate the very mysteries of loneliness, death, and the human condition – to fathom the unfathomable. This is one of Van Gogh’s final paintings before his death, and there’s a sense of existential awe on display here. I’ve always been haunted by this painting. A few years ago, I took a trip to Auvers-sur-Oise, just outside Paris, in the French countryside. It’s a quaint town where Van Gogh spent the last days of life. He and his brother, Theo, are buried next to each other in the old town cemetery. You can actually stand in that very field, just on the outskirts of the town center. Wheat still grows there. A sense of liberation accompanies the isolation. There’s no single simplistic interpretation for this work. Beauty resides beside death, interconnectedness beside solitude. The crows fly off as if freed from mortal constraints. The app – handsome in design and presentation – allows us to search by painting title, artistic movement or style, individual artist, and museum or collection. From his biography, we learn that Van Gogh was depressed, a loner who suffered from mental illness. He is the archetypal tortured artist, and it comes through in this work, which contains some of the raw and cathartic power of religious landscapes. It’s at once terrifying and deeply moving, fevered and sacredly still. [caption id="attachment_88654" align="aligncenter" width="2000"] One: Number 31, Jackson Pollock, 1950. Oil and enamel paint on canvas, 8' 10" x 17' 5 5/8" (269.5 x 530.8 cm). MoMA. [/caption] The Museum of Modern Art’s website and accompanying app are treasure troves of information about modern art. On the website, we come upon Jackson Pollock’s “One: Number 31” (1950), a sprawling and energetic large canvas work of abstract expressionism. If you were walking through the museum, which is in Manhattan, you’d be struck by the painting that seems to take up the entire room. The sheer scale of this work allows viewers to become immersed in the energy on display. One of the key features of the website and app is the collection of audio lectures on the various works inside the museum. It’s like having a personal guided tour of the museum. From these lectures, we learn that Pollock, who was greatly influenced by jazz, was predominantly interested in creating a rhythmic playground of abstract forms, lines, and colors. He did this by using an innovative technique that he honed and perfected wherein he laid an unstretched canvas on the ground and then used his brushes to drip and splatter paint on it. Though it looks “messy,” the piece is expertly composed and balanced. Your eye is pulled towards no particular area on the canvas but rather is allowed to roam and wander in search of meaning, pleasure, or experience. This style of modern art is unique on a technical level, but it also leads to some interesting philosophical speculations about order and chaos, civilization and wilderness, control and emotion, meaning and the universe. [caption id="attachment_88656" align="aligncenter" width="3991"] The last Judgment, Fresco, Michelangelo. 1536–1541. 13.7 m × 12 m (539.3 in × 472.4 in). Sistine Chapel, Vatican City. [/caption] Michelangelo’s “The Last Judgment” is an arresting fresco of the Italian Renaissance, covering the entire wall behind the altar of the Sistine Chapel. It must be seen to be believed. I had the opportunity to stand in the Sistine Chapel a couple of years ago, and I found it to be a completely immersive viewing experience. You wind your way through the labyrinthine halls of the Vatican Museums, anticipating the moment when you finally walk into one of the greatest artistic accomplishments of human history. Visitors are dwarfed by the high vaulted ceiling which is covered with frescoes of startling immediacy and power. The effect is a kind of spiritual grandeur and spectacle of Biblical proportions, heightened by the knowledge that this is the product of one man. iTunes U (short for University), provides lectures and full courses on a wide range of academic topics. You can take full courses, complete with online reading materials and course videos and audio lectures, on everything from quantum physics to art history. It’s an incredible resource. Through the audio lectures on Michelangelo’s Sistine Chapel, we learn that The Last Judgment took over four years to complete between 1536 and 1541. It’s a complex scene depicting the Second Coming of Christ and the judgment by God of humankind. The lower half of the fresco shows the twisted and distorted bodies of the damned as they are dragged down by demons into the Inferno. The top half shows the souls of the Saved, among the angels, ascending into Heaven. The struggle here is between good and evil, right and wrong, light and dark, as humanity faces its final reckoning. It’s an overpowering work of art – so viscerally alive in its depiction of violence and transcendence that it takes on the dynamic quality of cinema. Form and movement give way to the voices of the dead, which seem to echo out from the paint. Viewing it in person is a startling experience, creating a near religious, or holy, moment of catharsis. The Timeline of Art History provides a chronological, geographical, and thematic exploration of the history of art from around the world, as illustrated by the Metropolitan Museum of Art's collection. Though not as visually appealing as Google Arts & Culture, WikiArt is no less comprehensive, allowing users to navigate art history by either artist or painting. The two categories are further broken down by movements, schools, styles, genres, fields, dates, and gender. It’s an exhaustive survey of art history. Formerly StumbleUpon, Mix features randomized curated content based on user’s selected interests. 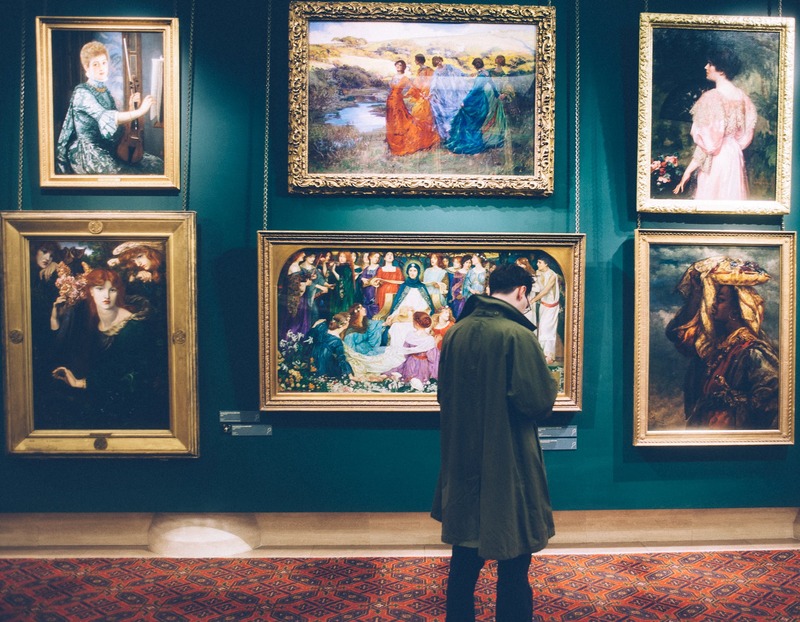 Selecting “Art History” as an interest will populate your feed with an assortment of fascinating articles and online resources. Highly recommended. Though not specifically about art history, this YouTube channel features fun-to-watch videos about mythology, world history, politics, economics, literature, and other topics that form great supplements for any serious student of art history. Highly recommended.